This morning we went out on the hunt and got a dik-dik, birds, and a wart hog. Alan and Ken both got to shoot the shot gun on this hunt and each killed a bird. The wart hogs tusks were not very large. Richard Dressan and his girls came up to join us for the night. We went out at 4 o’clock to let Richard try to get an Oryx since he had not gotten one for this year. We had been seeing them all morning, and the when Richard came we couldn’t get near one. Tonight we put Laymone and Joy inside the tent with us. Both of them seemed afraid, and it was 2 o’clock in the morning before Laymone got off to sleep. Then just after she settled down Alan and Ken woke up. They were asleep out in the car. So we had a sleepless night. While we were in Kenya hunting licenses were purchased year to year. You were only allowed to shoot so many animals like antelope and wart hog. 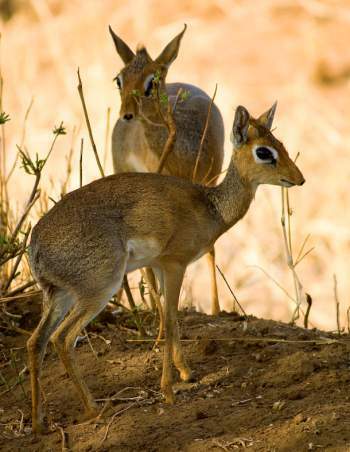 Dik-Dik was tasty but you were not going to feed the family long after the kill. Since we did most of our hunting for meat for mealtimes we did not try to kill many of these little antelopes. Alan and I both got to try out the 12 gauge double barreled shotgun today. For those of you not familiar with the trigger mechanism this type of gun has two. One fires the right barrel and one fires the left. However, you can fire both barrels at the same time. I was seven years old at the time and I can’t remember if I pulled both triggers or not, the thing I do remember is that the sky was very blue from my vantage point flat on my back in the grass. Looks like Richard got caught in that conundrum that faces all hunters at one time or another. Some days you see them and some days you don’t. I would take this time to make fun of the girls for being scared and having to sleep in the tent but those words would ring rather hollow from the guy who couldn’t even bed down in the safety of a steel closed cage like a car.